Beautiful bedroom will give you a deep sleep, feeling relaxed and peaceful. You will need a quiet, neat layout and a bed of smooth and beautiful. They will give you a good health. You should arrange your bedroom towards the Southwest and Northwest, two directions are very good for your development. In addition, you can also arrange your bedroom towards the West, it's good for the life of your spouse. If you are young and unmarried, you'd better locate your bedroom towards the East or Southeast. The bed is the most important thing in your bedroom and you must be very concerned about this. You should choose a suitable size bed. The height of the bed should be as high as your knee height. You should not choose low bed close to the ground. Keep the under of the bed clean and airy. Bed should be placed in the position where it can take a lot of light. Should not place the bed facing the door and the bed-head not rely on the window. You'd better place the bed towards the direction of North and South, agreed under the force of the magnetic field. When you sleep, your head should towards the south or north, it's good for your health. Do not locate bed-head towards the West or East. If the bed set towards the East or Southeast, the appropriate wall colors are green and blue. If the bed set towards the South, the appropriate wall color are light purple, yellow and light black. If the bed set towards the West, the appropriate wall colors are white and gray. If the bed set towards the North, the appropriate wall colors are gray, pink and red. If the bed set towards the Northwest, the appropriate wall colors are gray, white, pastel pink, yellow and black. If the bed set towards the East, the appropriate wall colors is pale yellow. If the bed set towards the Southwest, the appropriate wall colors are yellow and moss-green. 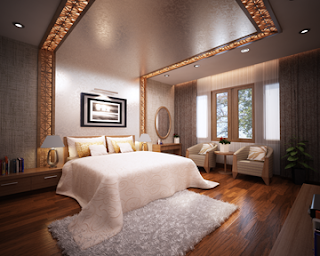 In addition to decorate bedroom according to feng shui, you also need to consider some other factors such as: quality of light, lighting systems, furniture and trees... For example, the light in your bedroom should be spread evenly, combined with the color of the walls, floors and your decorating style. The light-color furniture, such as gray, pale yellow or light brown color will bring a quiet atmosphere and elegant for your room and make your room becomes wider. The dark color furnitures such as dark yellow or dark brown will make your bedroom becomes fresh and full of vitality. According to feng shui, you can also decorate your bedroom with small flowers, but note should not place them too close to your bed. Flowering plants will clean the air in the room during the day but at night you should let them go outside. Let apply the principles of feng shui to decorate your bedroom because these are the very basic, simple and easy to apply principles. These will help you get beautiful bedroom, harmony, and you always feel happy, healthy and happy. This is very helpful solution for those people who want to keep their bedrooms free from any kind of mismanagement. For that purpose use of written tips is very helpful way for people that will give them positive results.